I was at UAL: London College of Communication on Monday night to hear Emily Bell give the Cudlipp lecture. She was very good. She started with a tl;dr version, which was smart and was - journalism needs more journalists who have a deep understanding of the technologies of the web. I was there partly because I've just been appointed a governor of UAL and I'm keen to help out with digital stuff. So I'm interested in what they're doing in that area. 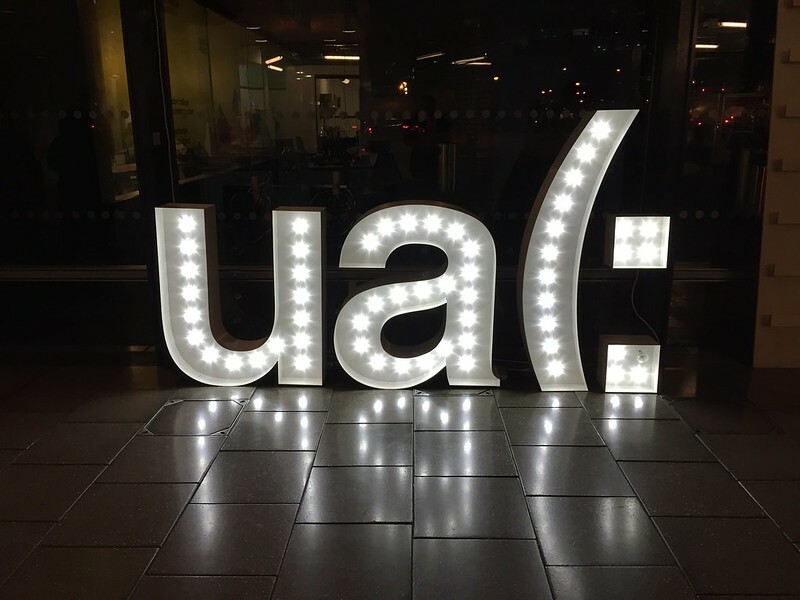 If you're a UAL student and you're reading this, I'd love to meet for coffee and hear what your experience of digital at UAL is. All of digital, the application process, the internal systems, the teaching resources and the teaching. Drop me a line. Details here. And this lit up logo was in reception, which is ace. It was made by Vent project. Some behind the scenes stuff here.